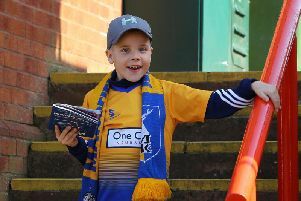 Mansfield Town boss Adam Murray hopes Roy Hodgson’s young England lions can make the knock-out stages and defy their eagerly-awaiting critics when the Euro 2016 Championships gets underway in France this weekend. Murray is also hoping to steal a few new tactical ideas from Europe’s national coaches as he avidly watches the games unfold. “I am looking forward to the Euros this year,” he said. “There will be a couple of new things that come out of it. “There will be a couple of new tactical things that will be approached in the Euros this year, so it will be good to dig into that and have a look at what the big coaches around Europe are doing and seeing if we can nick any ideas. Hodgson’s young charges have an average age of 25 – the youngest squad in the tournament – but Murray, who will be going with a very young Stags squad himself next season, said that may count in England’s favour. “I was having a conversation the other day with someone who has worked with England and I think everyone is excited at the minute,” he said. “It’s that young fresh mindset, no fear, that energy and that drive to be successful and wanting to prove people wrong. “Will we lack a little bit of experience at times? I think they will, yes. But I think they’ll make up for that when you’ve got that desire and that work ethic to match the ability and intelligence this young England team has got. So how far does Murray believe the young Lions can go this summer? “I think if England can get to the quarters or semis, for this young group that would be a massive achievement – probably an over-achievement at the minute,” he said. “It’s a group that has only been thrown together in the last few months with certain players going in on their club form. However, Murray knows the squad will have to put up with the brutal national media who traditionally put the boot into the national squad and manager as hard and often as possible. Even after England had finally managed to beat a talented Portugal side, who had shut up shop with 10 men for much of the friendly game, last week, the side were still criticised for not putting on more of a show by the ITV studio pundits. “What makes me laugh the most is that some of these pundits who have played the game, and some of them have played for their own country, are the first to put the knife in when it’s not the game they want to see,” said Murray. “It’s easy sitting behind a desk and camera talking tactics and picking teams. When you have to go out there and do the job and it’s on your shoulders, it’s not that easy. “It’s very easy to have these opinions. Everyone is a manager nowadays. Everyone is a Jamie Carragher until you get put in that position. Then it’s a different kettle of fish.